21st century is the era of Asia. Entertainment from East Asia is super! “21st century is the century of Asia ”…it has been a long time this phrase had been used. These 10 years, the economic ties inside EAST ASIA (including ASEAN 10) have been getting tighter and tighter – people, goods, money and information have been heavily exchanged among Great China area + Japan and Korea to a rapid degree. Based on the economic growth, major cities in EAST ASIA (including ASEAN 10) have started to produce their own entertainment culture and to transmit it out overseas. In parallel, we can even see the phenomenon that those cultures transmitted by each of the major cities in EAST ASIA such as Tokyo, Seoul, Taipei, Hong Kong, Shanghai, Beijing, Bangkok, Singapore etc. are to be gradually integrated inside the area. Talking about the mobility of people, the mobility has been on the increase due to business as well as sightseeing and studying overseas inside Asia. Everywhere youngsters are the main players of entertainment culture, and they are now hopping each major city of EAST ASIA (including ASEAN10), touching those entertainment cultures, taking them back to their own country. It can be said they are playing the role of “media” to exchange the entertainment cultures. When looking at the youngster cultural centers, say, in Shibuya of Tokyo, Myondon of Seoul, Ximenting of Taipei etc., you can easily see the similarity in their styles and you will get the impression that the national border has no meaning anymore. 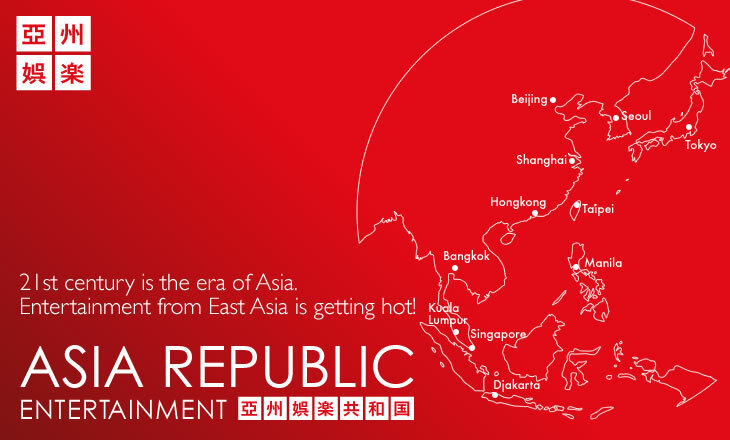 Asia Republic Entertainment, Inc. under the brand name of “亜州娯楽共和国” would like to contribute to the growth of entertainment cultures and economies in EAST ASIA through the business of introducing and exchanging the “contemporary” entertainment cultures in EAST ASIA.